← Why PDF to DWG Converter software failed to convert my scanned PDF file to vector DWG file? My application generates a PRN file. I want to convert this and drop the PDF file in a specific folder. Which product does this for me? If you can't convert your PRN file to PDF file by SPL to PDF Converter Command Line or SDK, please feel free send to us your sample PRN file for test purpose, after we analyze your PRN file, we will figure out a solution to you asap. VeryPDF provides reliable, easy to integrate, PCL to PDF or PCL to TIFF conversion tools for Enterprise IT Departments, Business Service Providers and Software Developers. VeryPDF has a long history of quality PCL emulation. Many corporate enterprises use VeryPDF (directly or indirectly) in the banking, insurance, healthcare and many other industries throughout North America, Europe, Australia and Asia. The ability of VeryPDF to turn corporate print data directly into electronic document files such as PDF or TIFF, enables corporate applications to process less paper (toward a paperless office) and to improve the easy of communication (email / fax) and document efficiency within the enterprise (document management / archive). Convert PCL print data to 200, 300, 400 or 600 dpi PDF, TIFF or many other document image file formats. Convert PCL print data to PDF files with searchable/selectable text included - extracted from the PCL data. Convert PCL print data for faxing, emailing, document delivery applications or web publishing. Capture PCL data from legacy applications and automatically convert to PDF on a server. Extracting Text from PCL data for indexing, workflow routing or archiving electronic document images. Break up PCL data into separate PCL pages for workflow processing. Or build up a document from PCL parts. Merge PCL print data with form overlays. Print forms to VeryPDF to generate overlays for use with content data. VeryPDF can emulate a network printer in a LAN/WAN environment to capture remote client print data to PDF files. How convert PCL generated by HP LaserJet 5 into PDF in C#? How to print PCL file output to PDF file instead of printer? We have files generated that are PCL and (after much tweaking of settings) can print them to physical printers, but we need to print to PDF files. Have installed VeryPDF Virtual PDF Printer (PDFcamp Printer), which will print a web page or document nicely as a PDF... but sending the PCL file it prints the PCL commands as literal text. Have changed/forced queue to raw, and searched the entire internets to no avail, and still cannot get the PCL file to print to a PDF-format file. We have a vended solution on an older machine, but with Linux being open-sourced and fancy-new... how do you take a PCL file output from an application and send it straight as a PDF file??? Thanks for any help/guidance. For these questions, the simple answer is "VeryPDF SPL to PDF Converter Command Line", you can use "VeryPDF SPL to PDF Converter Command Line" to convert from SPL, PRN, PCL, PXL, PS, XPS, PDF etc. 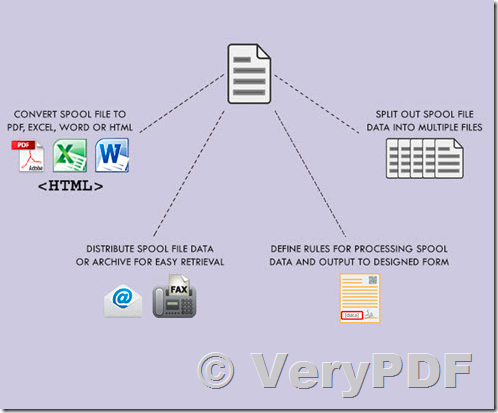 spool formats to PDF files easily, just download it and enjoy it! This entry was posted in Spool File Page Counter SDK and tagged PCL to PDF, prn to pdf, SPL to PDF, spool to pdf. Bookmark the permalink.